BelarusDigest > All > Will Lukashenka Mediate A Russian-Georgian Rapprochement? On 22-24 April Aliaksandr Lukashenka paid his first official visit to Georgia in the history of his reign. Belarus and Georgia have maintained minimal economic and political ties over the years, mainly due to Russia’s confrontation with Georgia that has continued to develop over the past decade. However, Belarus has refused to support the Russian-backed breakaway republics of Abkhazia and South Ossetia, for which it received a lot of support from Georgia in the international arena. Instead, Minsk seeks to counterbalance Russia's influence on post-Soviet integration projects, and an alliance of smaller states could make their voices stronger in talks with Kremlin. At the same time, Lukashenka’s rhetoric is pushing for a reconciliation between Russia and Georgia, which could enhance his positions both in Moscow and in the West. Lukashenka’s visit to Georgia was truly a historic event, as it was the first visit of Belarusian leader to Georgia after the USSR's collapse. Lukashenka met the President and Prime Minister of Georgia, the Patriarch of Georgian Orthodox Church, the leader of the autonomous republic of Ajaria and other senior officials. Several Belarusian Ministers accompanied Lukashenka and were behind him as they signed a number of agreements for industry, agriculture and internal affairs. So far Belarus has had little economic cooperation with Georgia, and bilateral trade has accounted for only $62m in trade in 2014. With Lithuania, a country of a similar size as Georgia, Belarus has a trade turnover of $1.5bn, a far more substantial amount. There is not even a Belarusian embassy in Georgia, though the Georgian embassy in Minsk has been working since 2007. 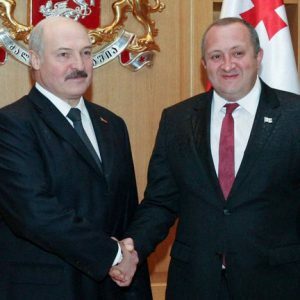 Upon his arrival in Tbilisi, Lukashenka has vocally emphasised Georgia’s role in backing Belarus internationally: “We have no issues politically. I am grateful to your former and present presidents for your support towards Belarus in the West”. Lukashenka has also stated that Belarus supports the territorial integrity of Georgia as recognised by international treaties. He promised that a Belarusian embassy will appear in Tbilisi within a year’s time. Lukashenka has also stressed that improving relations between Georgia and Russia remains an important issue: “I think that soon we will understand how to not only overcome this unfriendly rhetoric, but to reconcile the views of our countries and live as one big family as we did before”, Lukashenka stated. Belarus has never seen Georgia as a foreign policy priority, neither in political nor economic terms. In 2004 the Belarusian authorities viewed the new president of Georgia Mikheil Saakashvili cautiously after he came to power as a result of the Rose Revolution. At that time, ahead of the 2006 presidential elections, the Belarusian leadership was afraid of having a colour revolution break out at home, as one country after another rid themselves of their Soviet-era leadership. However, after the elections, as Lukashenka ensured his continued rule, and during the start of the Russian-Georgian tensions, the relations between the two countries began to improve. For one, Belarus refused to support Russia’s initiative like a ban on Georgian wine and mineral water, and even attempted to smuggle it into Russia. Furthermore, following the 2008 Russian-Georgian war, Belarus refused to recognise the self-proclaimed independent republics of South Ossetia and Abkhazia, both backed by Russia, which led to a bit of discontent in the Kremlin and garnered acclaim in the West. The Russian media has since repeatedly attacked Lukashenka for his position on the issue, an onslaught which they further responded to with purely pragmatic calculations – the Kremlin would not reimburse Belarus’ losses from possible sanctions by the West in case of their recognition. Belarus's position on the topic made Georgian leaders very happy and led to a lobby of active support for Belarus on the international level regardless of its undemocratic record. Lukashenka and Saakashvili met personally several times and seemed to have had very friendly ties. According to Wikileaks, Saakashvili unofficially invited Lukashenka to visit Georgia, but he said he would not dare to anger Russia by doing so. Russian Envoy or Talented International Player? The main question behind Lukashenka’s visit was its rationale – whether he came to Georgia as the president of an independent country or as Russia and the Eurasian Union’s envoy. Most Georgian experts think that Lukashenka came at the request of Putin, while also trying to capitalise on the role of being a mediator’s, as he has successfully done recently hosting European leaders at Minsk talks over Ukraine crisis. The Director of the Georgian Foundation for Strategic and International Studies Kakha Gogolashvili in a comment for Deutsche Welle opined that Lukashenka came with a message from Putin, as this visit could not have happened without the Kremlin’s permission. The development of Belarusian-Georgian relations was not Lukashenka’s key objective, or so many experts believe. However, Andrej Kazakievič, director of the Minsk-based ‘Political Sphere’ Institute, in a comment to Belarus Digest doubted that Putin played any role in Lukashenka’s visit. This move by the Belarusian leadership is rather logical in the context of pushing for a general improvement of relations with the West and pursuing a more balanced foreign policy. Belarus is attempting to counterbalance Russian dominance in post-Soviet projects like the Eurasian Economic Union and the CIS, and therefore seeks out alliances with other small states. The economic background of the visit is also important, despite the current insignificant trade figures, as particular sectors of the Belarusian economy can benefit from expanding in to the Georgian market. Clearly, Moscow is interested in engaging Georgia in the post-Soviet projects of Russia and helping to disway it from its EU and NATO aspirations, which Georgia have been consistently demonstrating. Meanwhile, Georgia realises that the west will not offer its military assistance in case of Russian intervention, as Ukraine conflict has showed, and it cannot therefore secure Georgia’s independence. The only thing Georgia can do in current situation is to improve relations with Moscow and other post-Soviet countries. And Lukashenka fits well in the role of peacemaker and mediator, both for Georgia and Russia. Lukashenka should be happy to play his part in this role, as he indeed is continuing to reap all kinds of benefits and strengthening his position in the West and in Russia, and thus securing himself another safe presidential term regardless of his electoral conduct. But his ambitions concern not only politics. Belarus has a long time failed to establish its economic interests in Georgia, as Russia would consider any serious improvement of relations as attack on its interests. Now, Lukashenka can kill two birds with one stone – ensure his political career and promote external trade with Belarus, which is experiencing tough times due to Russia's own recession. Both countries have completely different geopolitical aspirations, as Georgia has signed an association agreement with the EU and Belarus is a member of Russia-led Eurasian Economic Union. But as the Georgian president said during his meeting with Lukashenka, this situation presents them with more opportunities, though a significant challenge as well. Belarus and Georgia can use each other as entry ways into major geopolitical projects in the regions, and this mutual support is most beneficial for both. Belarus's recent leaning towards pro-Western nations in the Middle East follows fast on the heels of rapprochement with the West. On 6-7 May, Joint Belarus-Saudi Committee on Cooperation will meet in Riyadh. On 15 April, Belarus opened an embassy in Qatar. Establishing closer links with the very centres of conservative Arab bloc allied with the West is a milestone in Belarusian foreign policy. In the past, Minsk enjoyed amicable relations primarily with the so-called radical republican regimes in the Middle East. Saddam's Iraq, Qadhafi's Libya, Assad's Syria, as well as Ahmadinejad's Iran figured among Belarus's main partners. The shift towards pro-Western monarchies reveals a contradictory, yet pragmatic approach by Minsk. The Belarusian government is looking for quick money to compensate for Belarus's trade deficits with other countries, though some odd deals and alliances have emerged as a result. Commenting on the embassy opening in Qatar on 31 March, deputy foreign minister Alyaksandr Huryanau called Qatar Belarus's “longstanding political partner.” This is a remarkable statement given this nation's role in toppling Minsk's former friends in the Middle East. The partnership with Qatar complements Minsk's other policies in the region. Besides establishing closer relations with Saudi Arabia, the Belarusian government has undertaken many other activities in the region in the last two months. It held political consultations with Oman and the UAE, received an Omani parliamentary delegation, sent its representative to a ministerial meeting of the Arab League – dominated by conservative Arab nations, – and sent a delegation to Pakistan, another nation allied with the pro-Western bloc in the Middle East. What is more, Belarus has enjoyed excellent relations with Erdogan's Turkey and made attempts to befriend pro-Western Kurdistan. Minsk's policies in the Middle East complement its policy of rapprochement with the West. Belarus's attempt to move away from risky partners challenging the West is greatest in the history of its foreign policy to date. Belarus's previous, more limited, attempts at partnering with pro-Western states in the Middle East did not pay off as expected. In 2011, Minsk quietly renounced its close partnership with Libya and minimised its ties with Iran and Syria. It secured promises from Qatar of a new level of economic relations and investment. Alyaksandr Lukashenka has designs to create a kind of “Qatari Island,” a huge economic centre built on Arab money in Belarus, though thus far these and other plans have ended up creating nothing but a few hunting estates for Arab princes near Minsk. A similar fate befell another project publicised over the past couple years – bringing Omani money to Belarus. Omani businesses received a big swathe of land in Minsk to develop, but in 2012 gave up plans in the Belarusian capital. Yet trade with the Gulf Arab monarchies has continued to slowly grow. In 2014, Belarus-Saudi commodity trading was valued at more than $95m. This is almost as much as the last year's Belarus-Iran trade turn over of $97m. In addition, Minsk has become involved in murky deals with pro-Western Arab monarchies in other countries as well. This March, Reuters quoted an unpublished UN Security Council report on Belarus, according to which Beltekhekspart was supplying Libyan armed groups with ammunition. Minsk retorted that the deals were legal and involved the Libyan government. Importantly, the groups supplied by Belarus seem to enjoy Qatari support. Later on, the French specialist bulletin Intelligence online added that military equipment might be also supplied by the Belarusian firm to Libyan militias. According to the French publication, Western governments gave tacit support to these supplies. Away From Iran and Syria? As Minsk establishes rapport with the pro-Western Arab monarchies, it has been easing the level of contact with their opponents in the region – namely, Iran and Iran's allies. This year, Belarusian Foreign Minister Uladzimir Makei has visited Syria only once, this past February. Now, Tehran and its allies are displaying more interest in maintaining relations with Minsk. In February, the Iranian Foreign Minister Mohammad Javad Zarif came to Minsk, in April, and Iraqi Foreign Minister Ibrahim al-Jafari and Syrian Minister of Industry Kamaleddin Ta'am have visited Belarus. Yet these contacts are a mere shadow of Belarus's partnerships with these countries in the 2000s, when Minsk would host a new Iranian delegation almost every month. Minsk's recent level of engagement are not only less frequent but also far less meaningful. For example, Iraqi Foreign Minister's visit to Belarus resulted in both parties signing of the Memorandum of Understanding on Cooperation in Sports. Belarus's trade with both Iran and war-ravaged Syria has decreased in recent years. While in 2008, Belarus-Syria trade made up over $85m, last year it barely exceeded $30m. Current promises to establish an assembly production plant for Belarusian MAZ trucks in Syria are unlikely to materialise. While Iran may indeed pay for such a project in Syria, the ongoing civil war in Syria makes the actual implementation of the project unlikely in the near future. The Belarusian government may go as far as to use its relations with Syria, Iran, and Iraq as a bargaining chip in relations with Western-allied Arab monarchies. The kings of the Gulf's willingness to buy up Iran's allies has already been exposed by Wikileaks, though Belarus can hardly attract the attention of Arab rulers on its own, and as such it is becoming an important ally of Tehran and Damascus and even as a source of military equipment and expertise for Syria, Iran, or Shiite Iraq. The Belarusian leadership has not changed its ideological preferences; it had none to begin with. Not only does it is seek rapprochement with Western allies in the Middle East, but it has also followed a similar approach in other regions. For example, its reception of North Korea's Foreign Minister in March was rather cold. The Minister's trip was shortened by two days. Belarusian officials talked about "similar [to Pyongyang's] approaches to many issues" but not about "shared views," a standard statement in negotiations with developing countries. The Belarusian Foreign Ministry has emphasised that the meeting was "protocol-related". Regardless, deals can be made with Minsk. The logic of Belarusian foreign policy stems from the political economy of a land-locked country with no notable natural resources and an industry that is in bad need of modernisation. Even though Lukashenka has decried the so-called Arab spring, which knocked down some of his earlier comrades, he prefers to accept the new situation and is working with the victors. The main priority of the Belarusian government is finding money that will allow it to survive.